درگیرشدگی مدنی ازجمله ملزومات بنیادین مردم‌سالاری و شهروندی است. 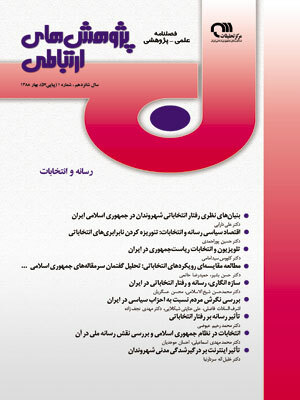 از ربع پایانی سده 20 به بعد با پدیده‌ای به نام «انفجار اطلاعات و آگاهی سیاره‌ای» روبه‌رو بوده‌ایم. اینترنت از یک‌سو‌، اطلاعات و نگرش‌های دموکراتیک را گسترش داده و از سوی دیگر نوعی مشارکت سیاسی جدید برخط (اینترنتی) را موجب شده است. در این نوشتار با بررسی نتایج برخی از مهم‌ترین مطالعات کمّی انجام شده، این نظریه برجسته شده است که اینترنت بر درگیرشدگی سیاسی جوانان و بزرگسالان تحصیلکرده‌تر در دو نوع یادشده (برخط و غیر برخط) تا حد به نسبت خوبی (نه قوی و زیاد) تأثیر‌گذار بوده است. بر‌اساس این مطالعات، نویسنده در پایان مدلی زمینه‌گرا در زمینه تأثیر اینترنت بر مشارکت سیاسی ارائه داده است. Civil engagement is one of the foundational requirements of democracy and citizenship. Since the last quarter of the 20th century, we have been facing a phenomenon called “Information Explosion and Planet Awareness”. Internet, on the one hand, has expanded our democratic knowledge and view, and on the other hand, it has brought a new political participation online. Discussing findings of some of the most important qualitative studies carried out in this field, the present article highlights the theory that internet has had a relatively good influence on adolescents and educated adults’ political engagement in these two ways: online and non-online. Based on these studies, the author has offered a contextual model for internet effect on political participation. Calenda, David & Mosca, Lorenzo. (2007). The Political Use of the Internet Information. Communication & Society, Vol. 10. Carter, Lemuria D. (2006). Political Participation in a Digital age. Ph.D. Dissertation in General Business, Virgina: faculty of virgina. Gibson, Rachel. (et.al). (2005). Online Participation in the UK. BJPIR, Vol.7. Hague, Barry. (1999). Digital Democracy. London: Rout ledge. Johnson, Abbott. (2001). Democracy & Internet Third world Quarterly. vol. 22, No.1. Loveless, P. Matthew. (2005). The Mediated Transition, Mass Media and Political Socialization in Central and Eastern Europe. Ph.D. Dissertation in Political Science, Indiana University. Malina, Ana. (2000). information literacy for active citizenship. London: Routledag. Maria, Anna. (1999). perspective on citizen Democratization. USA, Cholorado: MCbrow Hill. Norris, Pippa. (2000). A virtuous circle communication in post industrial societies. NY. Cambridge university press. Norris, Pippa. (2001). Digital Divide. Cambridge: Cambridge university press. Park Hun, M. (2007). How Does Information & Communication Technology Affect Civic Engagement? Ph.D. Dissertation in Mass Communication, Indiana University. Schifino, Linda. (2005). Engaging Vernacular Voices, Exploring Online Public Spheres of Discourse for Every day Citizens. Ph.D. Dissertation in Communication Science, Duqusne University. Tesaliki, Liza. (2002). Online Forums & The Enlargement of Public space Research Findings from a European Project, The Public. Vol. 9 (2). Zhighang, Sun. (2005). An O-S-O-R Examination if Relationship Between Mass communication, Social Capital and Civic Engagement. PH.D. Dissertation in Mass Communication ,Columbia University of Missouri.